Saint Edward the Confessor, son of King Ethelred and Queen Emma, was born between 1002 and 1005. He succeeded to the throne in 1042. In the following year he was crowned in Winchester Cathedral on Easter day by Eadsige, Archbishop of Canterbury. 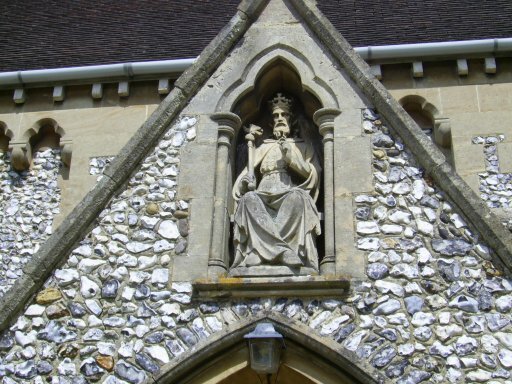 Sutton was already a royal manor in Saxon times, and for that reason, when the mission here was formally established in 1857, it was named after the royal saint. King Edward is best remembered as the refounder of Westminster Abbey. The new church, in which the Norman style of architecture on a large scale was introduced to England, was begun in 1050. Part of it was ready for consecration by the end of 1065. King Edward was by then dying, and the ceremony was hurriedly arranged, and performed by Archbishop Stigand of Canterbury on 28 December. The King died on 5 January 1066 and was buried the next day before the high altar. The short reign of Harold ended at the Battle of Hastings and Edward’s chosen successor, William the Conqueror, was crowned at Westminster Abbey on Christmas day 1066. The memory of King Edward’s sanctity was persistent, and there was a strong wish that he should be canonised. This was finally brought about by Pope Alexander III in 1161, at the request of Abbot Lawrence of Westminster. A more suitable place was found for his body, which was exhumed on 13 October 1163 in the presence of King Henry II and the Archbishop of Canterbury, Thomas Becket. The rebuilding of the Abbey was complete by 1269. The saint’s body now rests in a shrine behind the high altar. 13 October is celebrated as St Edward’s Day, both at Westminster Abbey and at the Church at Sutton Park. In 1561 the owner of Sutton Park Catholic Sir Henry Weston KB, grandson and heir of the founder of Sutton Place, was made Knight of the Bath at the coronation of Queen Elizabeth I. He married Dorothy Arundell of Wardour in Wiltshire in the same year. The Queen visited Sutton and stayed for three nights in 1560. Sir Henry Weston was Sheriff of Surrey in 1569 and 1571 and Member of Parliament for Surrey in 1571. To qualify, it was necessary for him to conform to the established Church, at least outwardly, and he made the declaration on 28 November 1569. The true state of affairs may be indicated by the official searches of Sutton Place for Catholic priests on 5 November 1578 and 14 June 1591, and the discovery in the 19th century of hiding places for priests, one concealing a casket of relics and another a chalice and paten. In 1911 the Parish Priest was Dr Arthur Hinsley. The focus of Catholic worship had moved from the manor house Sutton Place to the present Church which was opened on 27 September 1876. Dr Hinsley was a vigorous parish priest, he instituted the Corpus Christi procession (which still takes place here every year), moved the school to larger premises, set up the displays of relics which can be seen in the Church today, and cycled two or three times a week to teach history and sacred scripture at St John’s Seminary, Wonersh. During his tenure the reredos, with the tabernacle and exposition throne were given by Lord Howard of Glossop. Hinsley listed the known parishioners, estimating them at about one hundred and twenty, including children. Average participation was about seventy, rather less than the regular attendance of 130 today. After six years at St Edward’s he moved on in 1911. In 1935 he was appointed Archbishop of Westminster and in 1937 appointed a Cardinal. He died in office in 1943. He is buried in Westminster Cathedral. In 1962 the Parish Priest was Gordon Albion. During his tenure the church was consecrated by Bishop Cyril Cowderoy on 31 May 1950. The relics sealed in the altar were of St Grata, probably one of the forty-eight martyrs of Lyons, AD 177, and St Lucutisman. Canon Albion (as he later became) was also nurturing missions in Bellfields and Burpham. They became the parishes of Merrow with Burpham and St Mary’s Rydes Hill in 1973 and 1978 respectively. In 1959 the Church acquired from the Duke of Sutherland, then owner of Sutton Park, the car park, the field which includes the well and is now the extended graveyard, and the Thomas More ruff now in one of the display cases. These were the years of broadcasting from St Edward’s. Programmes were part of the BBC People’s Service. The most ambitious was the broadcast of Midnight Mass for Christmas 1957. Mass was of course still in Latin. A further six services were broadcast for the BBC General Overseas service. The services generated thousands of letters, every one of which was acknowledged by Gordon Albion.